One of the perks of attending my health-fitness-wellness program at Sharp Healthcare is receiving a weekly "Kettlebell & Physiokinetic Health Tip of the Week." I've received some requests to make these posts public, however, it wouldn't be fair to all my students who come to class to make it a "regular" thing to be shared. 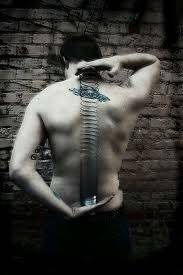 Nevertheless, I've been hearing a definite increased incidence of spine related problems, and so, I feel this is an appropriate post to share. Please enjoy an excerpt from my personal, Top 5 favorite exercises for a healthy spine! 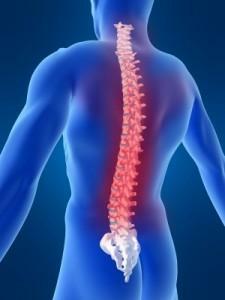 There is perhaps no more structurally integral part of our body than our spine. It is the lattice which supports our vital organs, it is the biomechanical foundation of the core complex, it protects our central nervous system along with our cranium, and, you only get ONE - unlike hands and feet... what affects the spine affects everything. If you stub a toe, you may cause compensatory motions up the chain or on the opposite side, but, it probably won't be as global or as salient as an injured back when even coughing or sneezing hurts. To identify the any “top 5” exercises, we need to first identify the risk factors. For the spine, repeated force loading (habitual movements) and chronic posture are what I consider to be the two of the biggest predictors of injury and pain. 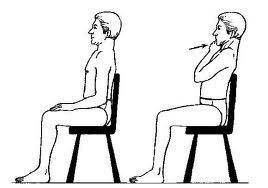 In class, we talk about posture ALL the time; posture is the foundation of good biomechanics and exercise form. However, repeated movement isn't discussed as often since we do all sorts of movements in the program which create muscular balance. Unfortunately, our daily lives tend not to be so balanced. Every time we bend forward to pick up something off the ground… even getting in and out of the car and when we go to tie our shoes. And, to make it worse, gravity does NOT help. Gravity forces our spine to collapse on itself, just like a slinky. So the bottom line is that forward bending, slouching... ANYTHING forward where the distance between the chest and belly button is shortened – those are bad deals for our spine. Logically, that means anything backwards is good, right? Well, in a great many of case, RIGHT! The biomechanical structure of our spine hinges on balance. For every forward movement, we need a backwards one. For every right leaning movement, we need a left leaning one. Balance. The picture below depicts a dramatic graphic of too much pressure from side bending. 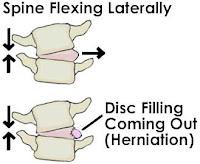 The purpose of this picture really is to demonstrate that the tissues in the spine move; just like any balloon, if you over pressure one side, it is likely to bulge or pop out the other. If you put pressure on the bulge, the balloon is likely to take normal form again and thus evenly distributing pressure/load. 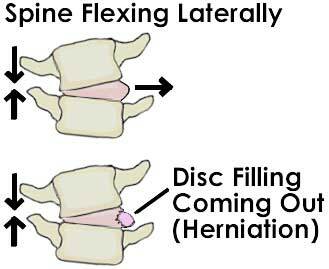 These exercises are very important to prevent (and treat) low back disc impairments. If you feel like your back is stiff after sitting or bending forward, there’s a good chance you need to do these exercises up to 10 times every 1-2 hours. If performing the standing back bends is a bit too aggravating or uncomfortable, do it in lying. 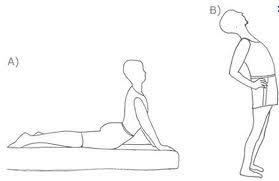 Laying prone will un-weight your spine allowing for more flexibility in a more forgiving application of physics. In either case, the most important concept is repetition at END RANGE of motion. Going back as far as possible and/or as is comfortable is the only way you will be able to reverse the abuse of forward bending, hunching, slouching, and all the other nasty habits we’ve formed in the computerized, smart phone using world. 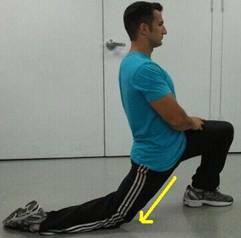 As mentioned in previous Tip of the Week’s, the Hip Flexor muscle group actually attaches to lumbar spine. 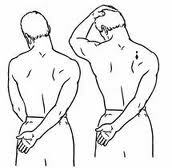 Tightness here can cause low back pain, muscle imbalance, faulty movement patterns… the works. This is chronically tight because our hips are almost always in a flexed position (ie. sitting, crouched, or kneeling). Stretching the hip flexors tend to be an exercise for which many people find relief. This is a follow up to the Chin Tucks. Holding your head on top of the spine is only as good as the restrictions you have. The muscles at the base of your head and back of your neck are too tight, you will be fighting yourself with the Chin Tuck exercise. Be sure to implement these two stretches to maximize the postural correction of the Chin Tuck and minimize the tension in the tissues. A neat FYI: these stretches are useful in alleviating tension type headaches. This exercise should look more or less familiar. 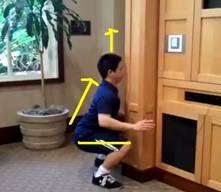 We perform the Functional Wall Squat in class from time to time to ensure good squatting mechanics and good spinal posture. This is an excellent mid-morning and mid-afternoon exercise to really ensure that your spine is getting a break from chronic loading patterns. Try holding this position for 30 seconds and repeat 3 times. And – That’s it! Those are my personal, Top Five (Favorite) Exercises for a Healthy Spine. Consistency & frequency are keys to living a healthy life: in general, going through these 5 exercises and performing them at least three times a day will give you the best results.